We all know that Mahaprabhu was born on February 18, 1486. It is also a well-known fact that for twenty-four years Lord Caitanya lived in the gṛhastha-āśrama in Nabadwip (CC Ādi 13.10, CC Madhya 1.15). Afterward, He accepted the renounced order of life, sannyāsa, and resided for twenty-four years more at Jagannātha Purī (CC Ādi 13.11, CC Madhya 1.17). “Of these last twenty-four years, He spent the first six continually touring India, sometimes in South India, sometimes in Bengal and sometimes in Vṛndāvana” (CC Ādi 13.12, CC Madhya 1.19). Other than these broad chronologies, we know very little about the exact timelines of His life events. The difficulty in constructing a reliable timeline of His life events lies in the fact that the years of most of those events are hardly recorded. However, Krishnadas Kaviraj Goswami, the most prominent biographer of Mahaprabhu, does mention the seasons/months and the duration of the major events in his most celebrated book, Sri Caitanya Caritamrita. We also get to know some event details from Kavi Karnapura’s play Sri Caitanya Candrodaya, and Murari Gupta’s Sri Krsna Caitanya Carita Maha Kavya. After careful evaluation of these sources, it is possible to construct a pretty coherent timeline of the major Chaitanya Leelas. First, I give a summary of the timelines in the following table constructed based on these books. Subsequently, I provide the detailed references and associated logics used in determining the proposed times. The modern astrology also records that a total lunar eclipse occurred on 18 February, 1486 (eclipse.gsfc.nasa.gov). The lunar eclipse, on its entirety, was visible from India. The penumbral eclipse lasted for 5 hours and 43 minutes. The partial eclipse lasted for 3 hours and 29 minutes. The total eclipse lasted for 58 minutes and 12 seconds. Maximum eclipse was at 4:51:51 pm GMT (10:21:51 pm Indian Standard Time- IST). Given that Mahaprabhu was born in the evening i.e. not long after the sunset and the moonrise, He must have been born around 6.00 – 6.30 pm IST* (the sun sets, and the full moon rises around 5.30 to 6.00 pm IST during that time of the year in West Bengal). In this case, His birth must have coincided with the first part of the penumbral eclipse (or just a few minutes before the eclipse started). * Many astrological websites use the birth time of 10:00 pm IST. However, 10:00 pm is a highly unlikely birth time for two reasons. First, 10:00 pm is not considered as evening in India by any means whereas it is clearly mentioned that Mahaprabhu was born in the evening (Sandhya). Second, 10:00 pm does not fulfill the condition of Leo Ascendant (Simha Lagna) and Leo Moon (Simha Rashi) as calculated by His maternal grandfather, Nilambar Chakrabarty in Mahaprabhu’s birth chart. 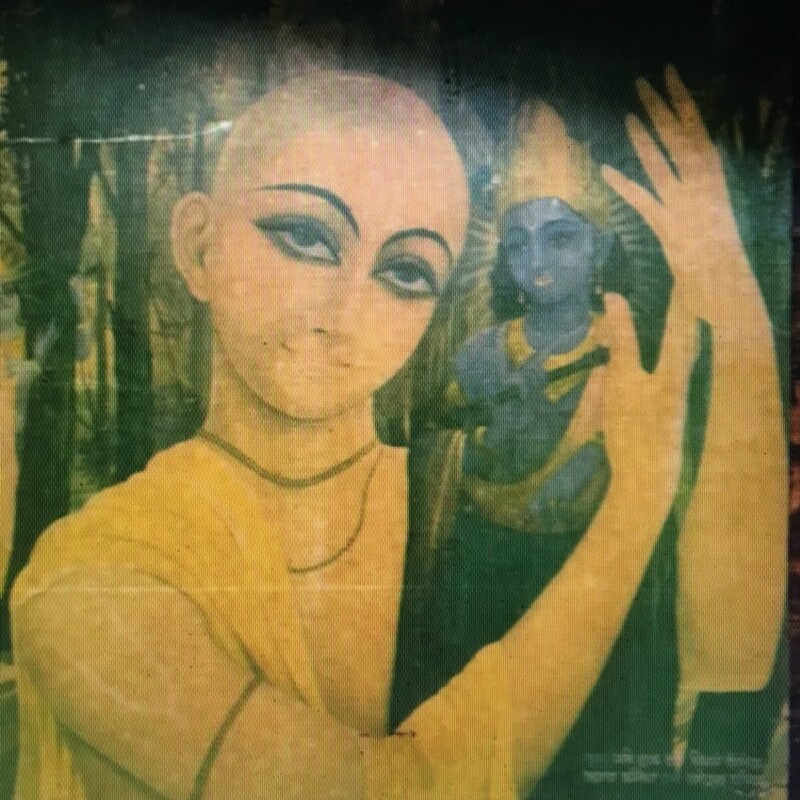 Sri Caitanya Caritamrita and other biographies of Mahaprabhu unequivocally mention that Mahaprabhu spent his first twenty-four years in Nabadwip and then took Sannyasa. Mahaprabhu turned twenty-four at the beginning of 1510 (Mid February / Mid March). Sri Caitanya Caritamrita mentions that he took Sannyasa during the month of Magha (Mid January / Mid February) of the same year he completed his twenty-fourth year. Hence, the most likely time of His taking sannyasa should be between Mid-January and Mid-February of 1510. Hence, the most likely time of His arrival at should be between Mid-February and Mid-March of 1510. Mahaprabhu expressed his interest to go to South India at the beginning of Vaisakha (Mid-April). When Mahaprabhu expressed his desire to go to South India, all the devotees became very morose. Particularly, Sarvabhauma Bhattacarya requested him to stay for a few more days. So, most likely, Mahaprabhu departed for His South India tour in the late April of 1510 and spent two years on the Tour. However, the month of His arrival to Jagannath Puri after His tour cannot be determined. Probably He returned to Jagannath Puri in the Middle/Summer of 1512. Mahaprabhu met Ramananda Raya at Vidyanagar in the earlier part of His South India Tour while He was descending to further South (i.e. not while he was returning after seeing all the Tirthas). The timing of this meeting can be indirectly inferred to be somewhere between Mid-December 1510 and Mid-January 1511 from another incidence mentioned in the Sri Chaitanya Chandrodaya play written by Kavi Karnapura (Sivananda Sen’s son). After coming back from South India, Mahaprabhu wanted to set out for Vrindavan immediately. However, He stayed at Jagannath Puri for two more years at the request of His intimate devotees, who could not bear His separation. Hence, it can be inferred that Mahaprabhu must have stayed at Jagannath Puri during 1512 – 1514. Devotees visited Puri and attended Ratha Yatra during the years 1512, 1513 and 1514. “I shall go to Vṛndāvana through Bengal and see both My mother and the river Ganges. Now would you two be pleased to give Me permission?” (CC Madhya 16.91). Sārvabhauma Bhaṭṭācārya and Rāmānanda Rāya both felt sorry that they had played so many tricks on the Lord to keep Him at Puri. After hearning Mahaprabhu’s request, they proposed that Mahaprabhu should leave once the rainy season is over. Subsequently, Mahaprabhu departed for Vrindavan on the day of Vijaya Dasami (CC Madhya 16.94), which must have fallen between late September and mid-October of 1514. During His travel, Mahaprabhu visited different devotees in Bengal. After crossing the border of Orissa state, He arrived at Pānihāṭi by boat. Thereafter, He visited the house of Rāghava Paṇḍita, and from there He went to Kumārahaṭṭa and eventually to Kuliyā. From there He went to Rāmakeli, where He saw Śrī Rūpa and Sanātana and accepted them as His chief disciples. Returning from Rāmakeli, He met Raghunātha dāsa, who stayed with Him for seven days at Santipur at the resident of Advaita Acarya. At Santipur, Mahaprabhu celebrated the Vyasa Puja of Madhavendra Puri around Mid-March – Mid-April of 1515 with much fanfare. Later, Śrī Caitanya Mahāprabhu assembled all His devotees and asked their permission to return to Jagannātha Purī (CC Madhya 16.245-246). Mahaprabhu decided not to go to Vrindavan and instead return to Jagannath Puri because hundreds and thousands of people were following him. He found it both inappropriate (CC Madhya 16.272) and inconvenient (CC Madhya 16.258) to travel with such a large crowd. Once Mahaprabhu returned to Jagannath Puri, He resolved to go to Vrindavan alone or, at the utmost, with one servant (CC Madhya 16.273) and requested the devotees to give Him permission to leave. All the devotees including Gadādhara Paṇḍita proposed that since the four months of the rainy season have just begun, Mahaprabhu should leave after the rainy season (CC Madhya 16.282). Being requested by all the devotees, Śrī Caitanya Mahāprabhu agreed to remain at Jagannātha Purī for four months (CC Madhya 16.285). So, we can infer that He must have left for Vrindavan around Mid-October of 1515. Mahaprabhu visited all the holy places in Vrindavan. At the beginning of the month of Māgha (Mid-January), Mahaprabhu’s traveling associates proposed that they should leave Vrindavan now and go to Prayāga so that they could have the opportunity of bathing in the Ganges at Prayāga during Makara-saṅkrānti (CC Madhya 18.145). The next morning, Mahaprabhu and His associates left Vrindavan. On the way, they had an encounter with the Pathan soldiers and Mahaprabhu delivered them. It was during this time when Mahaprabhu instructed Rupa Goswami (CC Madhya 19). Hence, the timing of this event should be around Late January of 1516. A few days later, Mahaprabhu arrived at Varanasi (Early February of 1516). This is when He instructed Sanatana Goswami (CC Madhya 20–24). The fact that Sanatana Goswami was wearing an expensive woolen blanket (bhoṭa-kambala) when he met Mahaprabhu also provides evidence that it was still winter (CC Madhya 20.82). It was also during His stay in Varanasi that all the sannyāsīs of Vārāṇasī including Prakāśānanda Sarasvatī became devotees of Śrī Caitanya Mahāprabhu (CC Madhya 25). Mahaprabhu then returned to Jagannātha Purī through the great forest of Jhārikhaṇḍa in central India. He remained at Jagannath Puri for the remaining years of His life. Have you considered also studying Lord Sri Krishna's life from a similar viewpoint? A friend and I were trying to pinpoint the Gregorian dates of Lord Krishna's life but did not find any conclusive evidence. Since it is much further back in history, it is more difficult than the timeline of Mahaprabhu's life. Just curious if you've done any research.